The Battle of Cambrai (20 November 1917) is always deemed to have been a British success, this is true, up to a point, although it had its setbacks. The earliest of these, which caused a significant, if temporary delay, occurred on Flesquières Ridge at about ten o’clock in the morning of that first day. Flesquières Ridge is not the eminence it sounds, the elevation is only 105 metres, but it represents a hill in such low-lying country and although the gradient is not steep it has to be tackled by slow-moving tanks, advancing at about walking pace. 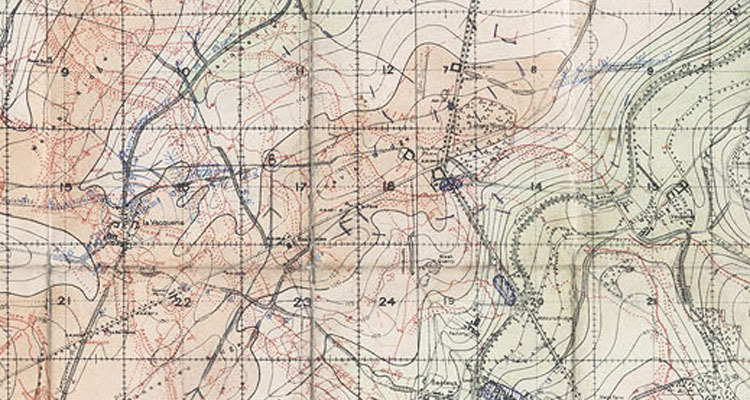 There are a number of reasons suggested as to why things went wrong on Flesquières Ridge. In the first place it was the site of a number of German field gun batteries covering what the British called the Hindenburg Support Line which ran along the crest of the ridge. 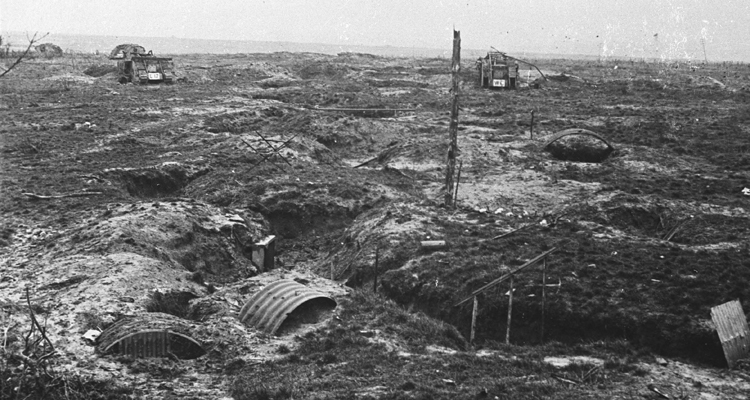 Some of these batteries had been trained in anti-tank work which involved moving the guns out of their usual dug-outs onto open ground where they could be swung around to follow moving tanks. Also in some cases the tanks were moving up the hill along existing tracks such as the Chemin des Vaches along which six tanks of E Battalion were proceeding in a column, nose to tail, so that they would reach the ridge one after the other. A closer view of Euryalus one of the Wire Crushers, although there is some doubt. Seen here being used as an observation post, with one broken track but a Lewis gun mounted in the starboard female sponson. Another problem, although a difficult one to evaluate, was that these tanks were working in conjunction with the 51st (Highland) Division, commanded by Major-General G. M. Harper. Harper is an odd character but probably not as reactionary as many writers have made out. Nicknamed ‘Uncle’ by the men in his division, he had the option, as did other divisional commanders, of introducing his own variations to the drill laid down by the Tank Corps, notably by Colonel J. F. C. Fuller a senior staff officer, for the co-operation of tanks and infantry in the forthcoming assault. 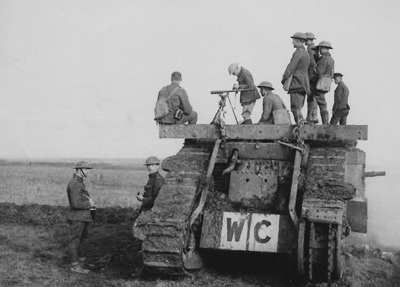 For instance Harper (who didn’t see tanks as the wonder weapon) introduced the idea of sending in the leading wave of tanks as dedicated Wire Crushers (symbolised by the letters W. C. painted at the back) which would lead the way and trample barbed wire entanglements flat so that the infantry could step over them and continue the advance. Harper also decreed that his men would follow some 200 metres behind the tanks, with the men dressed in ranks, rather than files as insisted elsewhere. This meant that when the tanks ran into trouble, as they did on Flesquières Ridge, the infantry were not there to support them, although whether this would have made any difference under the circumstances is questionable. 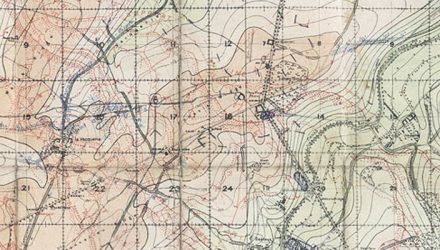 Another curious factor is the puzzling story of the ‘lone gunner of Flesquières Ridge’. The story centres around a gunner who remained with his battery and fired the only surviving gun single-handed, knocking out at least five tanks before he was shot down. The story was seized on by General Harper to prove that his infantry dispositions were not at fault under the circumstances, and was selected by Field Marshal Haig in one of his reports as an example of the courage of individual German soldiers and, it is said, to explain the disaster that had occurred. The Germans had never heard of this heroic act but concluded that it must refer to Sergeant Theodor Kruger, and in due course erected a statue to him. Philippe Gocrznski, in Following the Tanks also mentions Sergeant Kruger, saying that he was found, dead, alongside a gun of his battery but there is no evidence that he was ever alone. In the meantime the number of tanks knocked out by the ‘lone gunner’ had risen from five to sixteen. Gorczynski reckons that in all some forty tanks were knocked out although he attributes this to a number of batteries, not just one, let alone one gun. It is also interesting to observe that the British Official Report claims that the ‘lone gunner’ was an officer whereas the German version shows him as an N. C. O. 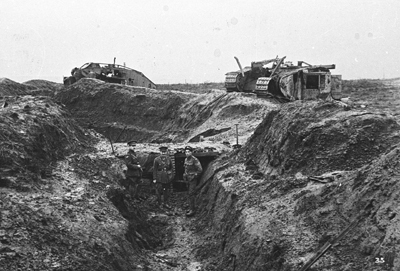 Another view, taken later, showing British officers in a German trench with the wrecks of E17, Egypt II and the Wire Crusher Euryalus above. There is only one instance of a gallantry awards being issued for the action. Although three men from the same tanks gained medals we are going to concentrate on the Military Medal awarded to Second Lieutenant Wilfred Bion (although in the Tank Corps Book of Honour he is named as William). Bion commanded tank No, 2353, a Mark IV male carrying the name Edward II and the unit number E40 which was in the second wave to reach Flesuières Ridge where it was duly knocked out. Bion dismounted from his tank along with his crew, two of whom were already wounded and deployed the men, with machine-guns from the tank to take on German machine-guns, raking the area from a nearby wood. Bion, finding that he could not hit one machine-gun, climbed back on top of his tank with a Lewis gun and fired from there, but here we have a slight problem. Both the original citation, and Bion himself, in his autobiography, claims the tank was still carrying its fascine, indeed Bion says that he fired over the top of it. But other accounts of the action don’t mention a fascine and a photograph purporting to show Edward II knocked out on Flesquières Ridge shows it without a fascine fitted, nor is there one on the ground around it. So that is one problem we can’t answer.